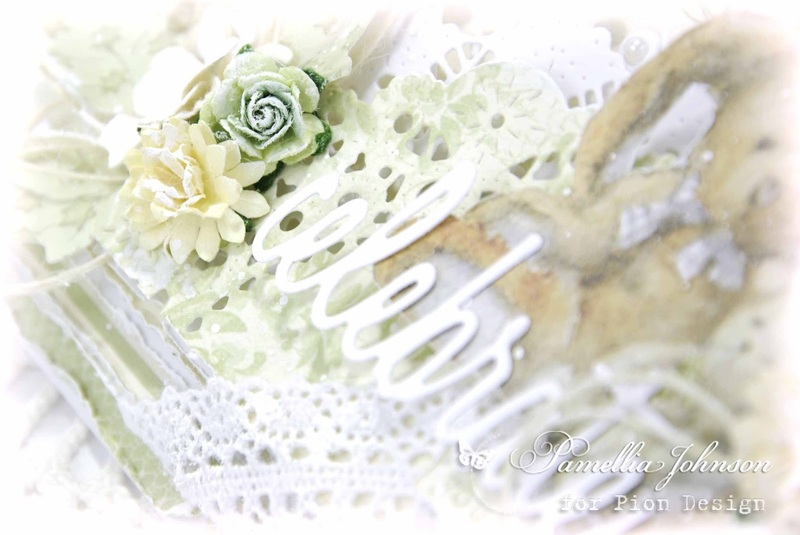 I'm sharing today another card featuring the precious Pion Design collection "Theodore & Bella" and I've also used some beautiful papers from "The Songbird's Secret". 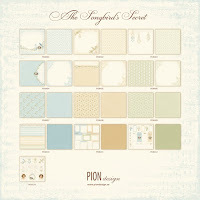 As you can see, they coordinate together perfectly, I love that about Pion papers! So they are predicting snow for this weekend, but I'm not sure how I feel about that now. Don't get me wrong, snow is my favourite weather, but it feels like winter has long been over. The grass is peeking through, the summer birds have started arriving, and I've already started drawing out my plans for the new patio... DOH! Oh well, it does make for nice photos, so what the heck! "Some people don't understand why I talk to the animals. That's ok, the animals understand." The American Robin is a summer bird, so to see one sitting on a snow covered branch is a bit odd! Look everyone, Missy finally came out from behind the tree! Unfortunately it seems she only did so, to blow me a raspberry! Lol. That's ok, I gave her a treat anyway! Does everyone remember Rocky? He doesn't come around often, but when he does he always makes me smile. His fur is very unique in colour, a sort of greyish brown. He's tough and brave and I miss him when he's away! "I see the peanut, have patience human! I'm basically down hill skiing head first!" "OK lady, one more picture and then I want my reward!" 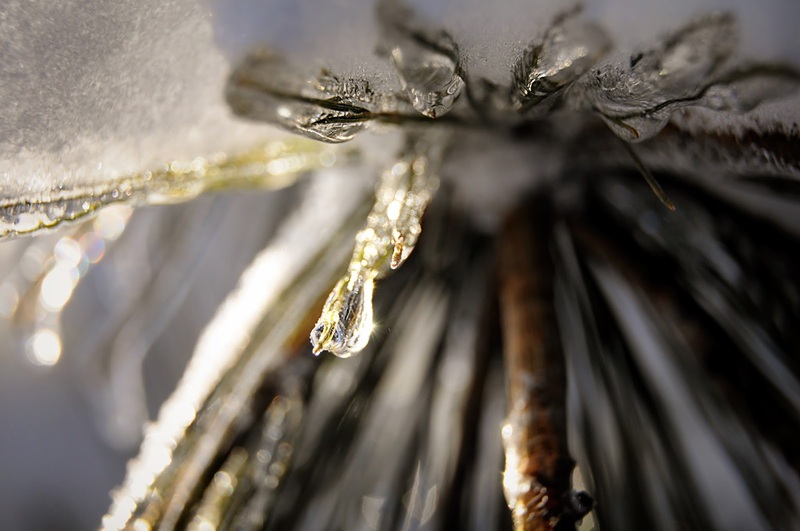 For my macro, some snow and ice!! 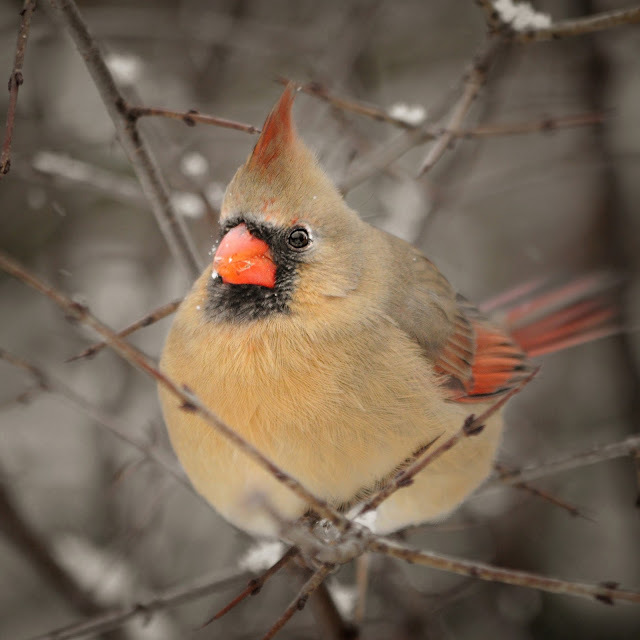 Another stunning creation Pamellia - love your snow shot, and your gorgeous bird and squirrel photos. 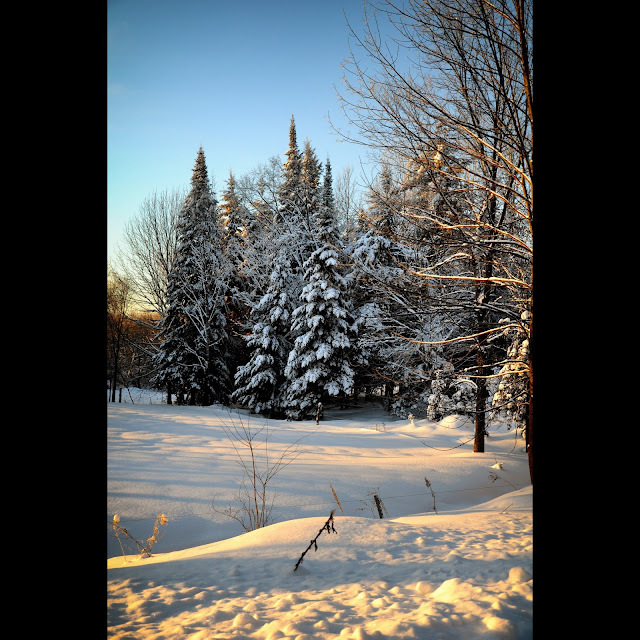 Very beautiful card and the images are just right for you and they look snuggled up in fluffy snow. Hope the snow stays away for you now as you have waited so long for it to arrive and have other plans. Always the way eh? Gorgeous, gorgeous card Pamellia, those papers look even more beautiful in your hands, you really do bring them to life! Oh what fabulous shots! Your birds are so much more colourful than ours... We've had some baby squirrels running around lately and there's also a new kitty on the block! Its a gorgeous card again today, all the papers blend so well together. Fabulous photos of the feathered and furry friends and you always add such super comments to go with them. You've waited so long for the snow, I hope if it arrives you will be able to get the photo shots you wanted and will be safe. Gorgeous card as always Pamellia! Love those papers and the way you bring out their beauty. Thank you for the inspiration. Have a wonderful weekend. I like Mr Chubb! and look for him in your posts. Pretty card too! I think the little airplane adds interest. 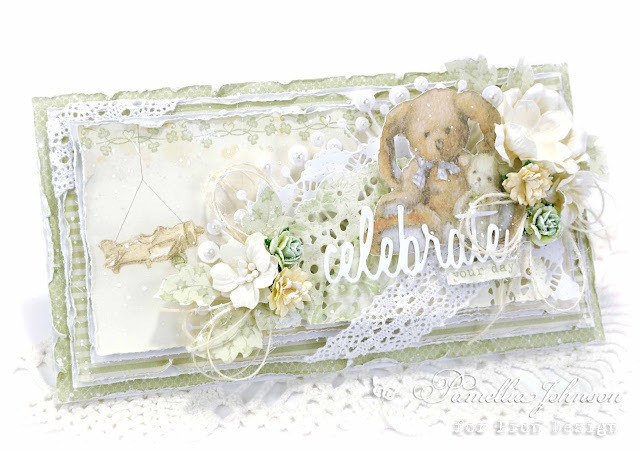 Once again wonderful card.love all the soft colours and embellishments. Super pics of all your furry friends. Have a good weekend. Once again, I am in awe of your fabulous cards. Love taking in all the layers and accents. We finally had a small snowfall yesterday--heavy snow/rain is predicted for Monday night. My guess is we'll fall into the rain line again. :( Not been a great winter! 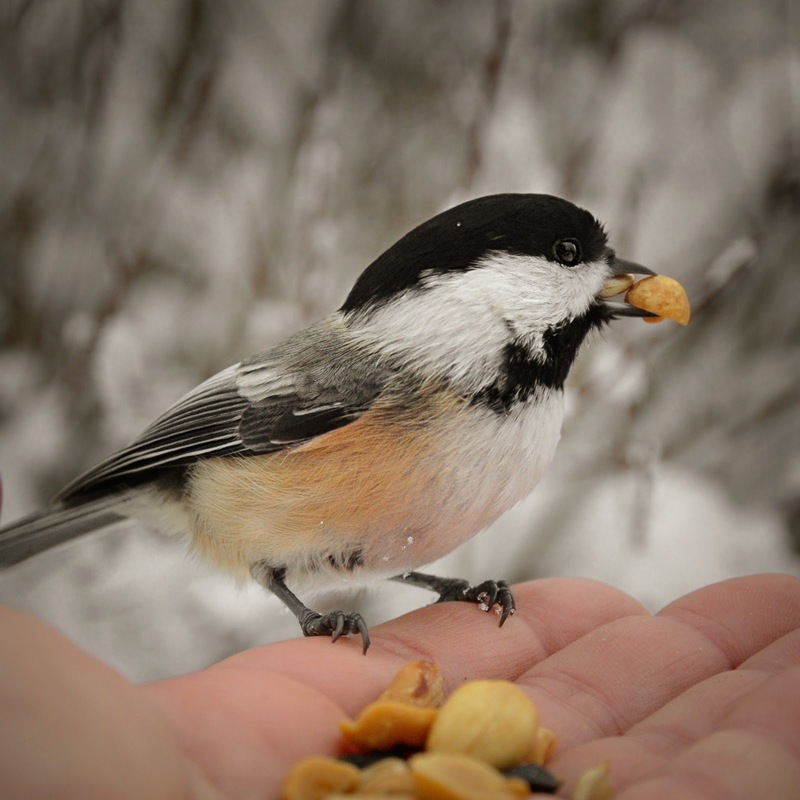 I am curious how you take photos of the birds eating from your hand. Is your camera on a tripod/timer? Aww, thanks so much Patty. I don't use a tripod or a timer, I just hold the camera with my right hand as steady as I can and hope for a clear shot. lol. The first thing I noticed was the lace on the corner, how strange when all is put together so beautifully, with more lace and lots of details. LOVEing the photos, we have a garden full of Daffodils and buds Spring is definitely on her way. Supercute card and papers!! Love the lace in the corner and in the bottom!! The white diecut sentiment matches so well with the label and such sweet airplane! Beautiful flowers arrangement as always! Love that Anthony Douglas Williams quote... so true!!!! 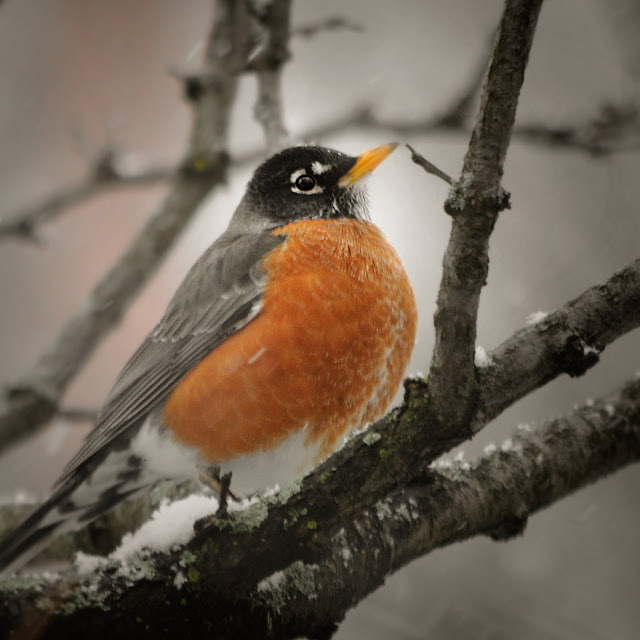 Stunning hearing that the American Robin is a summer bird... Spring is just arrived and we haven't seen it? The photo of Perfect Patti makes me smile... Poor her, skiing didn't seem too much fun for a squirrel! 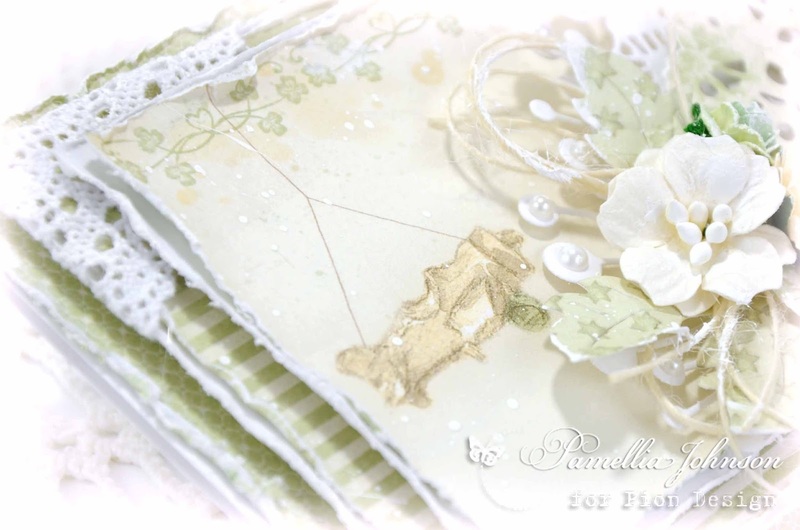 Another stunning card Pamellia, your amazing creations do justice to these gorgeous papers! Love the teddy bear theme and the wonderful soft colours, gorgeous lace and flowers! Spring seems to have arrived here...hope it stays! Enjoy your weekend, whatever the weather! 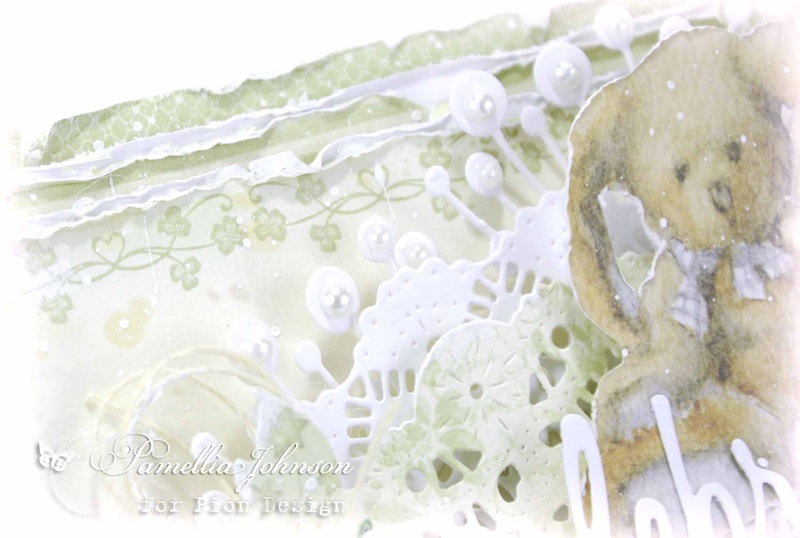 Gorgeous card Pamellia, love all the white layers just peeking through. 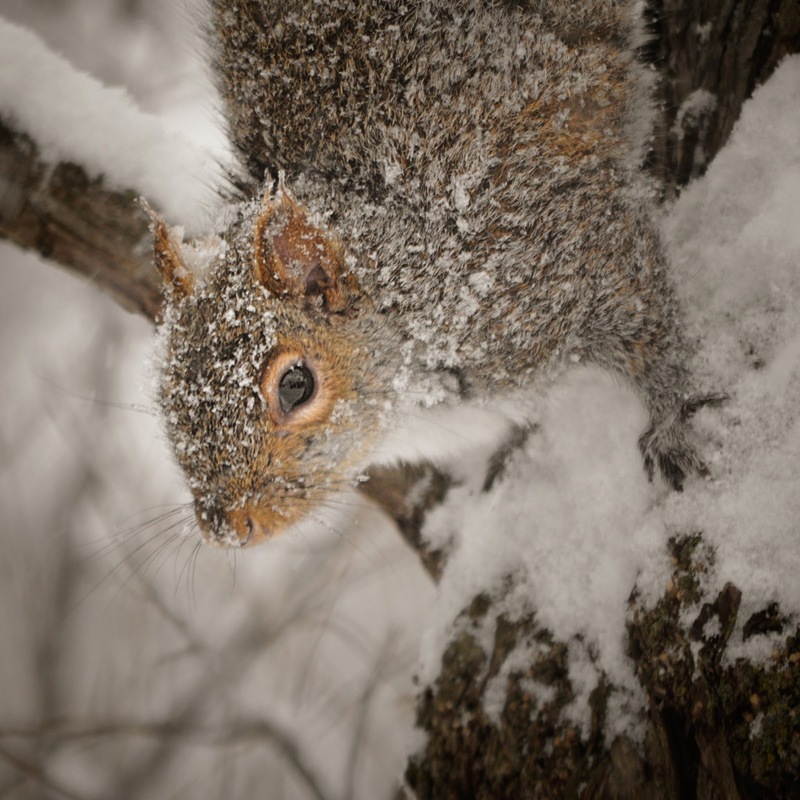 Wonderful photos - hope you don't get too much snow! This is such a delightful collection, another brilliant card, I specially love the cluster on this one, perfect with the lace. Like you, I feel I'm done with winter weather, but your photos like always are incredible, the light in that first one, - wow! Your card is stunning, Pamellia!! The layers are so gorgeous!! I just love the sweet animals and beautiful papers!! The details you added are so perfect!! I love the lace-wrapped corners!! Spectacular as always, my friend!! Another gorgeous baby card Pamellia..beautiful soft colours and lovely details..the lace wrapped corners are very pretty..
Gorgeous baby card lots of layers and detail . Like how you wrapped the lace diagonally . Awesome photos don't know how you can remember all their names ! Another stunning baby card Pamellia, do love the gorgeous papers, delicate colours with those lovely teddies and embellishments. 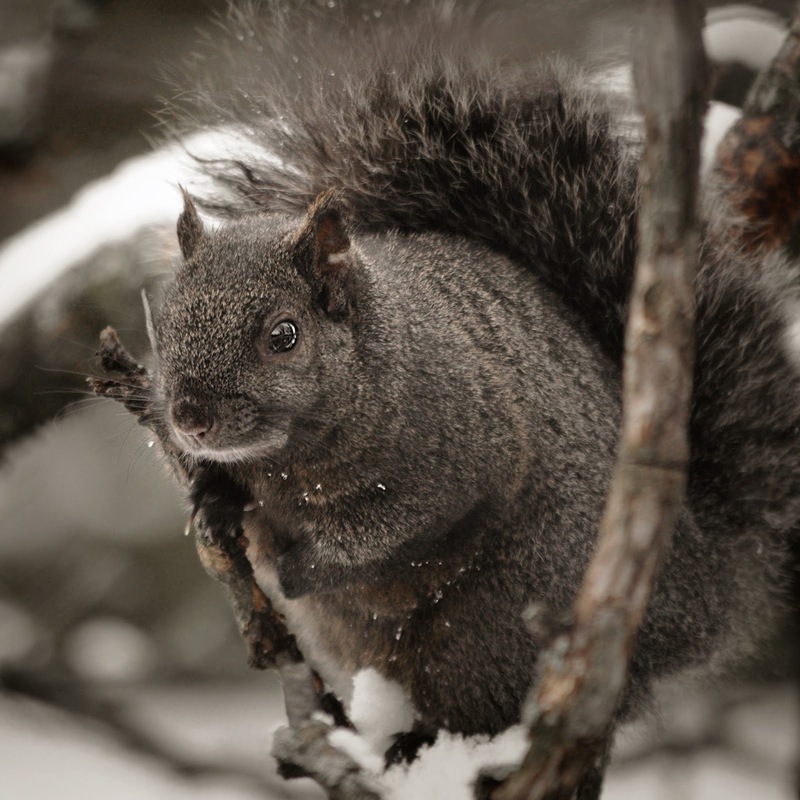 Wonderful photo shots, those birds are amazing as is the squirrels. 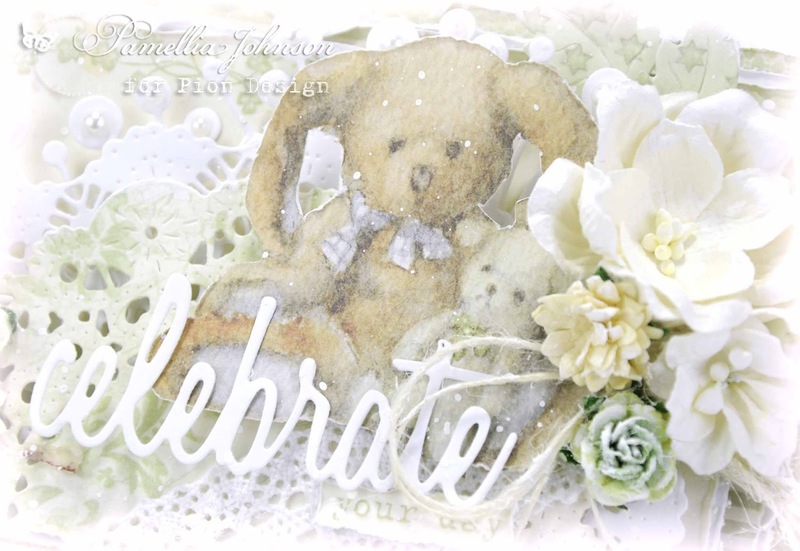 Pamellia, what a gorgeous baby card! You work wonders with those papers with the layers and details you add. I love the lace wrapped corner and the beads on the chloe stems, the delicate die cuts and flower clusters. It all makes for one beautiful gift for someone's special day! Love the photography; your macro shot is stunning, and of course, I love to see the wildlife! 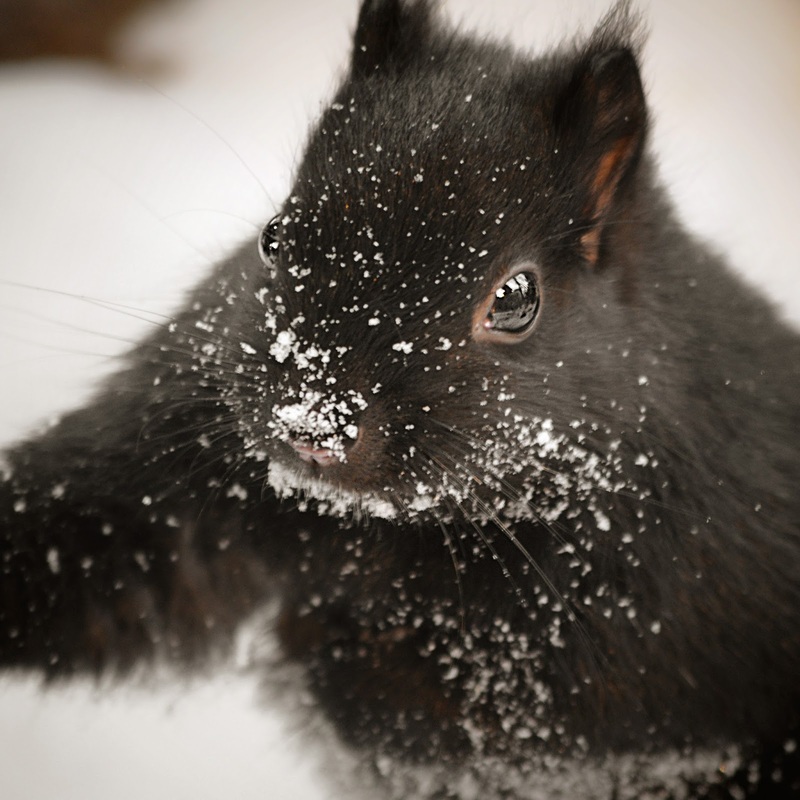 The squirrels look even more adorable with snow in their fur. 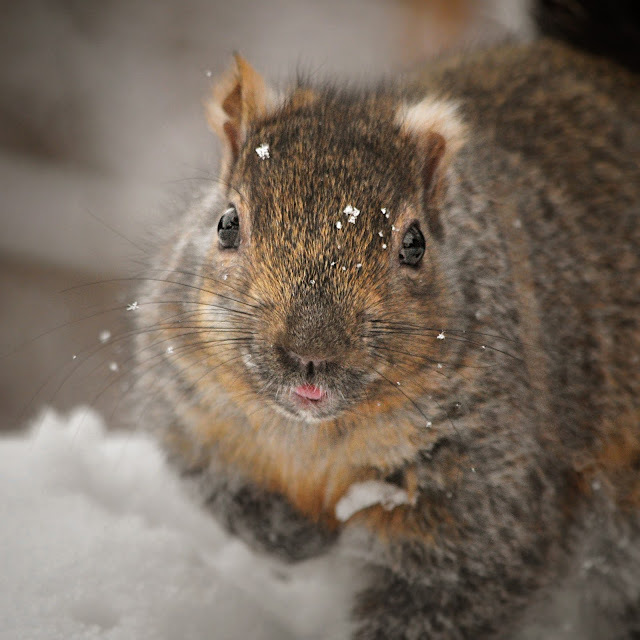 Enjoy your snowy weekend! 1-3 inches predicted here, but so far it's just the usual cold rain. Sending hugs your way! Hi Pamellia I am loving your stunning creation so much your design skills have always held me in awe, the colours and embellishments are always so beautiful, your pictures are full of both beauty and delight, the animals all look so colourful and perfect they have a true friend in you. You wanted snow, Pamellia, and now we're paying the price all the way down here in Florida where it is supposed to drop into the low 30s for the next several days. Of course, that is normal "winter" weather for our area, but like your area, everything is blooming, and the caladium bulbs are already several inches above ground (not supposed to do that for another 8 weeks!). Not sure what will happen, but I'll cover my plants for the week after the rains pass thru. I just KNOW it is! SUCH A SWEET CARD! 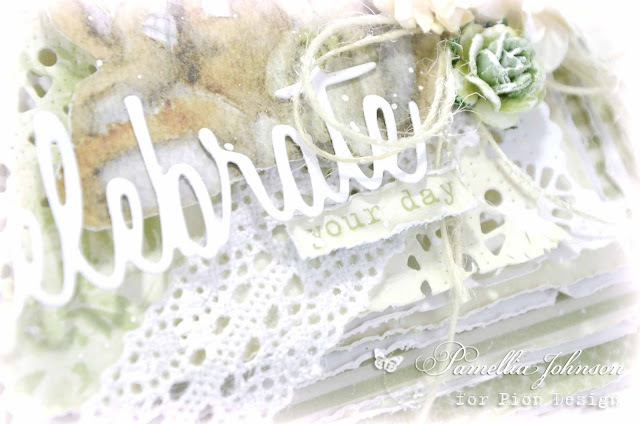 I especially love the delicate, die cut sentiment, and the pretty, heavy lace wrapped around the corner of the cardstock. GREAT design tip I plan to case. Beautifully designed, and so sweet, Miss Pamellia! Yikes! Your macro looked like a spider at first glance (goes to show what we have an abundance of right now in our area LOL) - Thanks for sharing your critter friends today, and for interjecting their thoughts and comments on the world - giggling. Sending lots of wishes for beauty in your day. Oh another beautiful Theodore and Bella card, how totally wonderful. Gorgeous design and I love the addition of the lace. Such a delicae look to this card, perfect for a new born. Love the snow pictures, although I understand what you are saying about the birds that have started nesting, it is a bit of a worry. Love the shot of Perfect Patti covered in snow and what an amazing macro today. A super gorgeous baby card, Pamellia! So soft, so delicate, parfectly layered and so very beautiful! It's my new favourite of yours, my friend! My heart is singing when I see your fantastic photos! The macro one is absolutely stunning and I always love to see your awesome wildlife ones! Your furry friends are so adorable and cute! I miss the snow! Your cards are like the filo of craft. Layer upon layer of loveliness. A fine mixture of cute and elegant. You wanted snow missy so careful what you wish for lol! Hi Pamellia, I just love looking at your blog, your photos are perfect, I love the snow too, but here in Melbourne, Australia we don't get any 😕 The squirrels and your words just seem so right together! I'm English and living there I loved going to the woods and seeing the squirrels, such a treat! 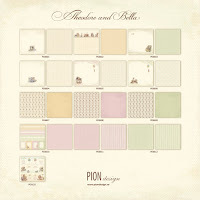 I've now got the new pion Theodore &a Bella collection papers so can't wait to get crafting with them, mind you they won't be as stunning as your cards but I'll be happy with them. Oh - love the little airplane - that made this card so unique and it's just perfect! Such a beautifully sweet card. Today - Mr. Chubb is my favorite photo - he made me laugh!! And YOU made me laugh with your Patti skiing head first downhill comment!!! I just so delight in your posts Pamellia! Xj.